Don't expect deep thought today. I'm just rambling a little. Oh, and I am giving it a quick edit at the end. So my hun was asking me about Chinese Food and Xmas. I tried to answer, but I didn't have all of the facts. When I was 20 or younger, Xmas and Xmas Eve were the two nights and one day you couldn't shop anything. No fast food, no gas, no supermarkets. 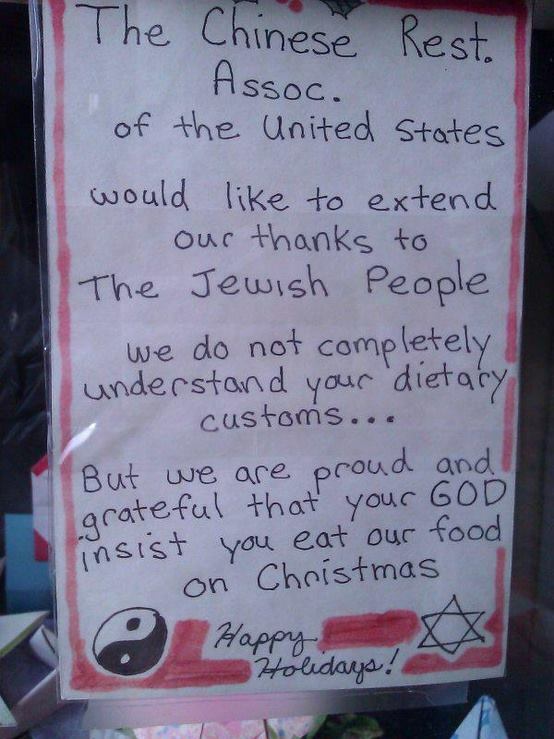 The exception was Chinese Food. You could order that for delivery, or pick it up. I suppose you could eat it there, but our family didn't do that for some reason. During the same period, I don't recall any geniune Chinese Food, but instead, we could get this version that was popular in Canada and United States. It's still popular here. Fried Rice, Chow Mein, Chicken Balls. Oh oh oh! Red Sauce. For any other food, meat was never sweet, but the folks really liked the 'sweet and sour' sauce. In Toronto, Chinese restaurants have a real history. In North America, many railroads were built by the Chinese immigrants. Most were from Canton. It was a kind of slavery, you see. There were paid poorly, and many work related accidents injured them, or took their lives. Not Cool. So some families here opened diners. If you looked white, then all you could find out about was Canadian style foods, like french fries, hot dogs, hot meat sandwich with mashed and gravy. If you looked Chinese, they had a hand-written menu with traditional favourites. These favourites have a lovely smell, and people would ask 'what is he having?' and so these diners became 'Chinese and Canadian Food.' White folk still got a different menu, but it had this Chinese Food as part of the list. This is a generalization. A lot of tasty Chinese meals that didn't appeal to Canadians in 1960 were things that included bones, shells or other things that were to be eaten, but not swallowed. So a dish with barbecue pork was good, but the same dish with barbecue wings was not, and a dish with ribs in sauce was also not popular. Now we see all of these on the menu, but it wasn't popular back then. If you know me at all, you know I really like Chinese lunch buffets, even though they will probably kill me off shortly. I used to try have that once a week, but it became once a month, and since 2015, I guess only once or twice a year. I love it just as much as I used to, but all of the wonderful fried things cause such a powerful food coma, I tell myself 'never again' but crave it again probably six months later. While you can have Red Sauce on anything, Chicken Balls come to mind first. Like other things made of bread, or fried, they're best when very fresh. They get hard and awful quickly. Fried Wonton, also available at most buffets, seem to keep better, and enjoy Red Sauce just as much. My childhood memory is the Fried Rice with sauce. We would get a large 16oz container for the five of us, and it just wasn't enough. I crave the 1960 Chinese Food taste frequently. When I finally get a chance for it, I don't eat so much 'chinese food' and end up maxxing out on fried food. Not wise, is it? Close to where we hold the English Dance is a busy Chinese Food kitchen, where we've had some wonderful Cantonese Chow Mein. But if I do a buffet, I'll fill up on other things. The Egg Roll. These have the same taste and smell as they did back in 1960. This is not the same as The Spring Roll. When these are fresh, they are the most wonderful bean sprout pie. Fresh is always good, but they need to be just right in temperature. The moment they come out of the fry basket, you burn yourself just touching it. A couple of minutes after that, you can bite it, only to get burned by the contents. Finally, it's good for about ten minutes, after which it isn't as much fun as it should be. Do you remember The Apple Egg Roll? I used to call McDonald's apple pie an Apple Egg Roll. McD used to fry them, and now they're baked, but the pastry has enough fat that it comes out of the oven fried just the same anyway. I'm not a health nut. I just think they shouldn't be pushed around by popular opinion so much. The fat content was about the same, and McD changed how they did it only because of public perception. I've been full of cravings recently. I wanted Swiss Chalet chicken sauce today more than anything else! That will have to wait, because The Swish that I went to closed at 300pm. That got me thinking, and got me observing too. Who would be open late? Who would be open all night long? What can you get Erev Xmas? Tonight life took me to Lawrence Ave E, at Warden. Goodness, so many Egyptian places open! There is a plaza at Ellesmere and Warden is on top of a hill. The lot was mostly full, the stores were mostly open. That plaza specializes in East Indian. Not sure which country. Close to home, we have many Sri Lankan open kitchens. The corner of Sheppard E and Warden has THREE different gasoline stations, all open xmas and open 24h. I continued along Sheppard (travelled Westbound) and found many gas stations open along the way. Not every Popeyes was open, but one was (Sheppard and Willowdale). My folks were warning me about spot checks. These often happen for xmas and new years. I didn't find any police. That's too bad, because I found three cars with people who should have asked someone to drive them home! The first was a white van driving the same speed as me, just slowly drifting into me! The second was a small black car waiting at a red light, and then just started going through it; then, like a pang of guilt, started driving extra slowly. Finally, there was someone following me too closely. But then, he made a left turn, which became a U-turn. These are legal here. But then he did another U-turn, and then another. This was on Sheppard near Birchmount. I'm not sure when he finished going round and round, I was watching my own driving. I'm not sure it's illegal to drive in a circle like that on an empty roadway. It did seem very interesting to watch. Toronto drivers often like going fast, perhaps 20kmh over the limit. That's what happened along Highway 401. I didn't see that on the regular streets tonight. Instead, I saw drivers holding at 10 over, and slower if someone touched they're brakes. I'm home. I want to bake a bread, but shouldn't at all. I'd eat more than half of it before retiring. I'm trying to keep my hand out of a box of Triscuit next to me.